Ειπεν δε, Aνθρωπος τις ειχεν δυο υιους. και ειπεν ο νεωτερος αυτων τω πατρι, Πατερ, δος μοι το επιβαλλον μερος της ουσιας. ο δε διειλεν αυτοις τον βιον. 11-12 Then he said: A certain man used to have two sons. And the younger of them said to the father: Father, give me my share of your property. He now divided his livelihood among them. Is that not a strange sentence with which Jesus started this parable, the parable known as the Prodigal, the Lost Son? A man who used to have two sons? However, this parable does not deal about an ordinary person. The certain man depicts YHWH Elohim, the heavenly Father himself, and he uses to have two sons for a very long time. And of course, in this case, these are no sons in the ordinary way! Most versions have: "A certain man had two sons". Here, however, Luke did not use the aorist but the imperfect form of the verb, and by its use an action is proposed in its course, so as continuously, not yet completed (durative aspect). Also, this form of time is sometimes used to express a pursuit or an attempt (the conatu). For example: And they wanted to call him Zacharias, according to his father's name (Luke 1:59). On that basis, we could render this verse (11): "A certain man [YHWH God] wanted to have two sons". Such a representation would then express what the Evangelist actually meant to say, namely that God - in his eternal council - had decided to have two special "sons." Blessed be YHWH, the God of Shem... God enlarge Japheth, Let him dwell in the tents of Shem. The Elder: The people in the lineage of Shem which, to clear later, would run via the patriarchs Abraham, Isaac and Jacob, ultimately flowing into the nation Israel. Compare Gn 11:10-26. The Younger: The Heathen World outside that lineage. That of course brings us to the question:: What was the historical moment when the Younger Son said to the Father: Father, give me my share of your property? But YHWH went down to see the city and the tower that the sons of men had built. After that YHWH said, Look! They are one people and there is one language for them all. And this is just the beginning of their doing. Why, now there is nothing that they may scheme to do that will be unattainable for them. Come let us descend and there confuse their speech so that they no longer understand each other's language. Thus YHWH scattered them all over the surface of the earth, and they gradually stopped building the city. Therefore, its name is called Babel, because there YHWH confused the speech of the whole earth, and because Yahweh scattered them from there over the surface of the earth. Note further that immediately after, in Genesis 11, the report continues with the detailed listing of Shem’s special germ line that would lead to Abraham. In the past generations he permitted all the Gentiles to go on in their own ways, although he did not leave himself without testimony by doing good, by giving you rains from heaven and fertile seasons (Hn 14:16-17). Και μετ ου πολλας ημερας συναγαγων παντα ονουνουνου υιος απεδημησεν εις χωραν μακραν, και εκει διεσκορπισεν την ουσιαν αυτου ζωνασωτως. Δαπανησαντος δε αυτου παντα εγενετο λιμος ισχυρα κατα την χωραν εκεινην, και αυτος ηρξατο υστερεισθαι. 13-14 Not many days after that, the younger son, after having gathered all things, went travelling abroad to a far country, and there he wasted his property by leading a corrupt life. When he had spent everything, there was a severe famine over that country and he started to be in need. Keep therefore in mind that you, once the Gentiles in [the] flesh, called uncircumsized - by the so-called circumcision made by hands in the flesh - that you at that time were without Messiah, alienated from Israel's citizenship and foreigners of the Covenants of promise, having no hope and without god in the world. In addition, the degeneration was strongly promoted by the perverse influence and activity of the demons. Jesus himself has revealed that, with the Confusion of Tongues, the so called Times of the Gentiles had their start, in the Bible book of Daniel also designated as the Seven Times. Those times are characterized by the fact that YHWH his rule in the Kingdom of mankind has temporarily suspended. And he did that for the duration of Seven times, or 4200 years. To you I will give all this power and its glory, because to me it [all the kingdoms of the inhabited world] has been delivered and to whomever I wish, I give it. Since then, there has been a supernatural rule over humanity, but of what a bad quality! Our struggle is not against blood and flesh, but against the governments, against the powers, against the world-rulers of this darkness, against the wicked spirits in the heavenly spheres. Compare also John 14:30 and 2 Cor 4:4.
και πορευθεις εκολληθη ενι των πολιτων της χωρας εκεινης , και επεμψεν αυτον εις τους αγρους αυτου βοσκειν χοιρους · και επεθυμειχορτασθηναι εκ των κερατιων ων ησθιον οι χοιροι , και ουδεις εδιδου αυτω. 15-16 He even went and attached himself to one of the people of that land, and he sent him into his fields to herd swine. In addition, regularly he desired to be filled with the peels that the swine were eating, and no one gave him anything. Abroad - the Heathen world that has Satan as a god - not any sprout of spiritual food can be found. At most spiritual waste: The Satanic doctrines of demons. Those teachings have been presented to the world during the so-called Times of the Gentiles, which from their start were dominated by the Great Babel, a system of deceased religion that was developed out of the original Babel, where the Confusion of Tongues had its start. Compare 1 Tim 4:1; 2 Kor 11:14 and Rev 17:4-5. In this part of the parable, the Younger Son begins to assume the characteristics of a special group within the Heathen world. For not all people within that world experience her atmosphere as mentally disastrous. On the contrary, the majority loves the world, does not suffer from spiritual impoverishment, but even delights in its unjust ways (1 John 2:15-17; Rom 1:20-32). It is true that in the person of the Messiah a force is located that people like the tax collectors and sinners draws to him: The way the great Shepherd, the Father God, is seeking lost people. Because, as is revealed in God’s Word, a person does not look quickly out of himself for the way of the apprenticeship. YHWH Elohim must draw him to do so. However, it really helps when the sinful Adamitic man starts getting some awareness of his impoverished state with God. The spiritual famine by which the world is characterized can trigger that awareness, but often even that is not enough for someone to take firm steps on the way that is leading back to the Father (Acts 17:26-27). Sometimes the misery must be felt even deeper, as in the case of the Lost Son. Due to the need, he had to join himself to a citizen in that distant country. Of course also a Gentile and thus a mentally blind person who did not worry about him at all. 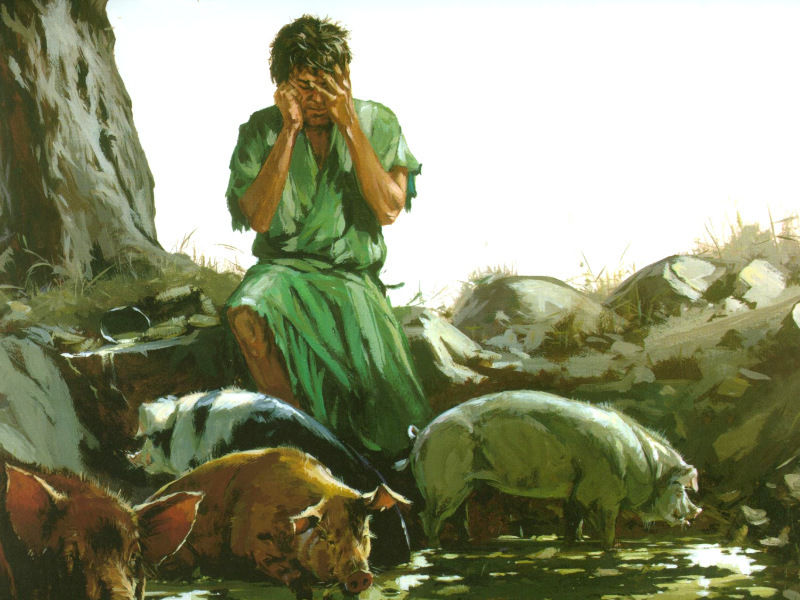 That man sent him to his fields to herd unclean pigs, and because no one gave him something to eat - not even the peels that were devoured by the pigs – he had secretly to appropriate that waste in order to fill somewhat his belly, fighting the hunger. The former 'friends' had disappeared. Nobody was worried about him. Thus, he was gradually manoeuvred into the position that led to a mental awakening. When the Most High assigned to the nations their inheritance, when he separated the sons of men [at the time of the Speech confusion], he set the boundaries of the Gentiles according to the number of the sons of Israel. • In connection with his seed all the Gentiles will be blessed. • The Promised Land to be owned permanently by him and his seed. • The covenant, with the corresponding promises, will be repeated and confirmed next to Isaac and Jacob (Genesis 12, 13, 15, 22, 26, 28). 2094 AM - Abraham receives the blessing of Melchizedek, possibly Shem who then lived and had reached the age of 536 years (Gen 14). 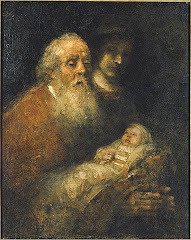 2108 AM - Introduction of circumcision as a sign of the covenant for Abraham and his seed (Gen 17). 2266 AM - On his journey back to Canaan, Jacob is called Israel at the time of the struggle with the angel (Gen 32 and 33). From that year certain periods can be counted in relation to Israel. 2277 AM - The history of Joseph unfolds from this year (Gen 37-50). 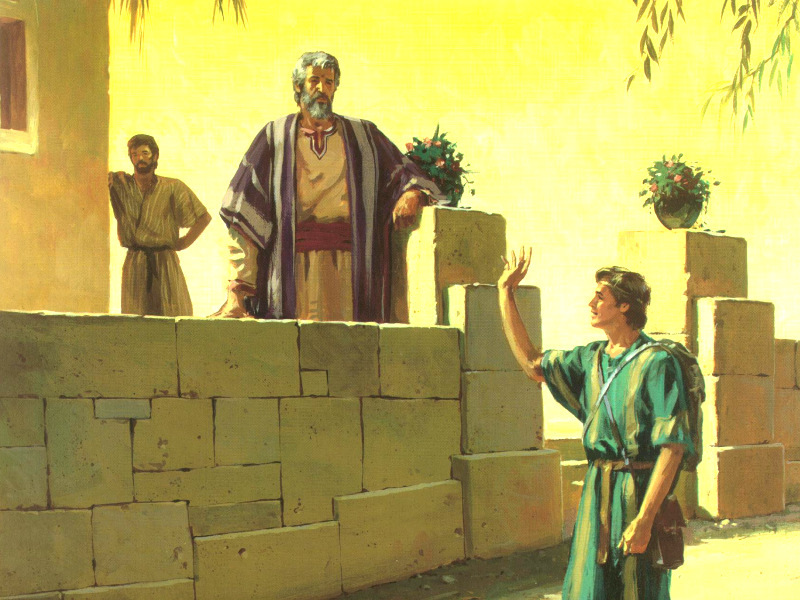 2290 AM - Joseph becomes Food administrator in Egypt, keeping Jacob and his descendants alive by a great escape (Gen 45:7). 2514 AM - Ten plagues over Egypt leading to the Exodus of Israel, of which the 12 Tribes have grown to a million people. In Sinai, YHWH Elohim enters into the Law covenant with Israel and Moses as Mediator (Ex 7-20). In the wilderness, the Tabernacle is established, which will function as a type of the future Templecity New Jerusalem (Rev 21). 2554 AM – Under the leadership of Joshua, the 12 Tribes cross the Jordan and enter the Promised Land, which is largely conquered in about 6 years. 2950-2990 AM - David's kingship. With him, God makes the covenant for a lasting kingship in his lineage (2 Sam 7). 2990-3030 AM - Solomon king. The Temple in Jerusalem is being built to replace the Tabernacle. 3420 AM - After 420 years of operation, that First temple is destroyed by the Babylonians. According to the best available sources in 587/586 BC. Consequently the beginning of the Anno Mundi time account should be set at 4006 BC. (586 + 3420 = 4006). 3420-3468 AM - After the fall and destruction of Jerusalem, the Jews exiled to Babylon and freed from there by the Persian King Cyrus. As a result of Cyrus' decree, an Exile’s remnant returns in Jerusalem. 3491 AM - The construction of the Second temple is completed in 515 BC. 3562 AM - In the year 445 - 444 BC. Artaxerxes issued the decree to rebuild Jerusalem. From that year, the fulfilment of the Yearweeks prophecy concerning Israel and the city of Jerusalem had its start (Neh 2; Dan 9: 24-27). 4004 AM - Birth of Yeshua, the Messiah who will be king forever on the throne of David (Luke 1:30-33; 2:1-7). 4034 AM - Yeshua baptized by John; his public appearance starts, being confronted with the detoriation of Israel's religious leadership. The Older Son, however, is confronted with Yeshua’s merciful Messianic approach of lost people. 4038 AM - Messiah Jesus put to death. As a fulfilment of Isaiah 53:12, the true atoning sacrifice was then provided and after Yeshua’s ascension to heaven presented by him to his Father God, by entering the antitypical Most Holy Place (Matthew 20:28; 1 ​​Tim 2:5-6). 4055 AM - The Apostle Convention held in Jerusalem. The 1:2 ratio of Leviticus 12. You hypocrites, Isaiah aptly prophesied about you, saying: 'This people honours me with their lips, but their heart is far away from me. In vain, they bring me religious honour, teaching teachings that are commandments of men" (Matthew 15:7-9). εις εαυτον δε ελθων εφη, Ποσοι μισθιοι του πατρος μου περισσευονται αρτων, εγω δε λιμω ωδε απολλυμαι. αναστας πορευσομαι προς τονπατερα μου και ερω αυτω, Πατερ, ημαρτον εις τον ουρανον και ενωπιον σου, ουκετι ειμι αξιος κληθηναι υιος σου · ποιησον με ως ενα τωνμισθιων σου. Και αναστας ηλθεν προς τον πατερα εαυτου. ετι δε αυτου μακραν απεχοντος ειδεν αυτον ο πατηρ αυτου και εσπλαγχνισθη καιδραμων επεπεσεν επι τον τραχηλον αυτου και κατεφιλησεν αυτον. 17-20 When he came to his senses, he said, How many hired men of my father have bread in abundance, while I am perishing here from famine. I will rise and go to my father and say to him, Father, I sinned against heaven and before you, I am no longer worthy to be called your son. Make me like one of your hired men. And rising up he went to his father. And while he was yet far away, his father caught sight of him and was moved with compassion, and quickly [walking on him] he fell upon his neck and kissed him tenderly. His apparently long-term stay at the Pagan Hogpen has at last a beneficial effect. After a life controlled by unhealthy passions and characterized by mental malnutrition, the Younger Son turns his mind inside. He is going to see his affairs to reality and acknowledges that he did not act properly and that he himself is the cause of his misery. He distinguishes that his situation is infinitely much worse than the hired men serving his father. They suffer no shortage, while he is almost dead from starvation. In his despondent condition, the goodness of his father comes to his mind, and from this a firm decision ripens: Go back and humbly confess guilt, hoping for forgiveness. That confidential manner of appeal already has an encouraging sound. The reception is really surprising. Apparently, his father had been on the lookout, and when he caught sight of his son in the miserable condition of that one, he was deeply stirred. Certainly, not a pretty sight! Departed in blooming health and look now: A broken, exhausted man, approaching the paternal house reluctantly, deeply ashamed. However, from the son’s attitude so much sense of guilt is speaking that the father can only feel pity, and in his willingness to meet the unfortunate a long way, he hurries on him and embraces him warmly. Yes, even before his son could have uttered a single word. Does not that course of affairs in the parable give us a heart-warming image of our Father God! With what a joy he welcomes a returning sinner! And that is exactly the thing the Pharisees saw mirrored in Yeshua's attitude towards the ordinary members of the Jewish people, but for which they had no eye at all, filled as they were of their own alleged righteousness. Ειπεν δε ο υιος αυτω, Πατερ, ημαρτον εις τον ουρανον και ενωπιον σου, ουκετι ειμι αξιος κληθηναι υιος σου. ειπεν δε ο πατηρ προς τουςδουλους αυτου, Ταχυ εξενεγκατε στολην την πρωτην και ενδυσατε αυτον, και δοτε δακτυλιον εις την χειρα αυτου και υποδηματα εις τουςποδας, και φερετε τον μοσχον τον σιτευτον, θυσατε και φαγοντες ευφρανθωμεν, οτι ουτος ο υιος μου νεκρος ην Και ανεζησεν, ην απολωλωςκαι ευρεθη. Και ηρξαντο ευφραινεσθαι. 21-24 The son now said to him, father, I sinned against heaven and before you, I am no longer worthy of being called your son. But the father said to his slaves: Hurry! Bring out a robe, the best one, and clothe him with it; and put a seal-ring on his hand and sandals on his feet. Andbring the fattened calf, sacrifice it, and eating let us rejoice! For this my son was dead and came to life again; he was lost and was found. Andthey started to enjoy themselves. This passage in particular must have appealed Theophilus, the first reader of Luke’s Gospel (Luke 1:1-4). But, together with him, all of us – from origine "Gentiles" who mainly make up the heavenly Congregation – have good reason to rejoice in this Scripture part. Why? Because nowhere else in the Bible is expressed in a more moving and heart-warming manner the great merciful love that the Father God has proved us in the Messiah. Being happy about finding a sheep (the first parable in Luke 15), or a drachma (the second), could be attributed to a certain self-interest. But that a father is so excited about the return of a son, who previously appeared to be shamefully ungrateful, can only be explained by an unselfish fatherly love. The son does what he intended to say. He needs to confess his guilt and all his wrong deeds, proof that he truly is repentant. A theme also emphasized in this Gospel by Jesus. But uttering the request being allowed to be included among his father's hired servants, is no longer possible. The father interrupts him abruptly. Apparently, the son believed that he had to earn his stay and maintenance in his father's house, but his father smashed that idea - so characteristic of Judaism's legalism - immediately. 1. To bring a στολη, Greek for a long robe. Not a arbitrary long suit, but the first [πρωτη], in the sense of the best; the princple one. You did not receive a spirit of slavery, again to fear. But you received a spirit of adoption as sons in which we cry out: Abba, Father! By virtue of their faith, the members of the Israel of God are clothed with the "garment" of imputed justice. See Gal 3:6-9; Rom 4:1-12, 23-25; 5:1-2. And compare Isaiah 61:10; Psalm 132:9. He who guarantees that you and we are in the Messiah and he who anointed us, is God. He has also put his seal upon us and has given us the token of what is to come in our hearts, the spirit. If children, then also heirs; heirs of God, but joint-heirs with Messiah; if indeed we suffer with him, that we may also be glorified with him… What then shall we say about these things? If God is for us, who can be against us? He who didn’t spare his own Son, but delivered him up for us all, how would he not also with him freely give us all things? Who could bring a charge against God’s chosen ones? It is God who justifies. In the Septuagint (LXX) we find the Greek word for seal-ring, δακτυλιος, for instance in Gen 41:42 as a sign of transfer: Pharaoh who transferred royal powers to Joseph. Yeshua answered them, Amen, verily, I say unto you, Whosoever does sin is a slave of sin. But the slave does not remain forever in the house; the son remains forever. If therefore the Son sets you free, you will will be truly free. 4. To sacrifice the fattened calf, to satisfy the son’s ‘hunger’. I am the bread of life. Whoever comes to me will by no means be hungry ... This is the bread that descends from heaven, that every one may eat and not die. I am the living bread that came down from heaven; If any man eat of this bread he shall live forever. Besides, the bread I will give is my flesh for the life of the world. Without metaphoric language: The value of Yeshua’s atoning sacrifice is declared applicable to the son who arrived at repentance. For, let us not forget that Yeshua told this parable while on his way to Jerusalem to give his soul a ransom in exchange for many (Math 20:28). In God's family, this sacrifice, according to the example of ancient Israel, is eaten in great togetherness and joy as a community sacrifice (1 Cor 10:16-18). Ην δε ο υιος αυτου ο πρεσβυτερος εν αγρω · και ως ερχομενος ηγγισεν τη οικια, ηκουσεν συμφωνιας και χορων, και προσκαλεσαμενος ενα τωνπαιδων επυνθανετο τι αν ειη ταυτα. Ο δε ειπεν αυτω οτι Ο αδελφος σου ηκει, και εθυσεν ο πατηρ σουτον μοσχον τον σιτευτον, ουι υγιαινοντααυτον απελαβεν. Ωργισθη δε και ουκ ηθελεν εισελθειν. Ο δε πατηρ αυτου εξελθων παρεκαλει αυτον. 25-28 Now his older son was [busy] in the field; and when he came close to the house he heard music and dancing. And after calling one of the servants, he inquired what these things meant. He said to him, "Your brother has come, and your father sacrificed the fattened calf, because he received him back in health”. He now became wrathful and he did not want to enter. His father, on the other hand, went outside and began to urge him. The older son is astonished when he receives sound of celebration when approaching the house. No wonder he calls the first servant he sees: What does this mean? The servant’s response - that his brother has returned in good health - does not convey the real picture and therefore does not generate feelings of compassion with him. He has not seen the miserable condition in which his brother came home. All that he knows are the rumours that reached him in the course of time: That this good-for-nothing brother far away, in the company of women of the lowest kind, was busy wrecking the paternal fortune. And now that one is celebrated by his father! To this, he - the always faithful son - does not want to have any share! 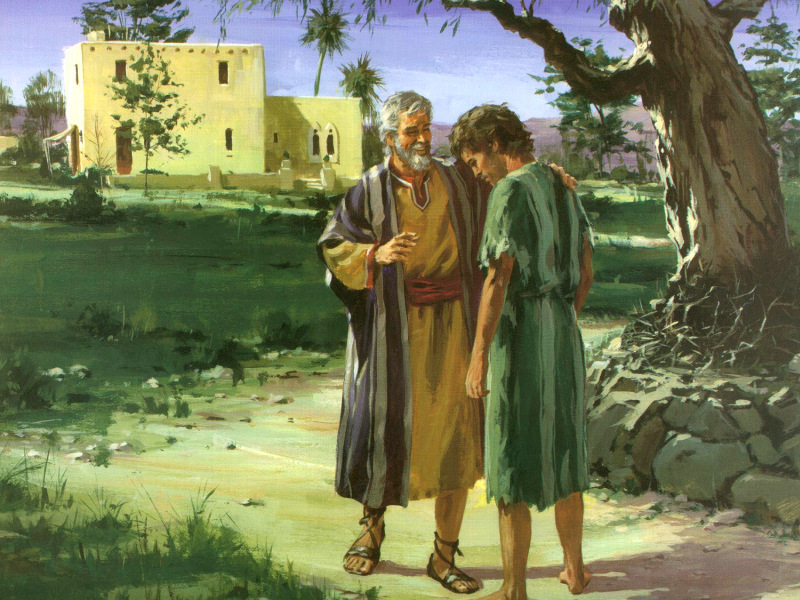 The father seems to have a great understanding of the feelings of his Older son, and therefore, for the second time, he comes outside, now to welcome him and persuade him to enter the paternal house and share in the joy of the feast. We can assume that his father accurately informs him about the miserable state of his brother's return. And also that his brother expressed his deep regret about his shameless conduct in the past. ο δε αποκριθεις ειπεν τω πατρι αυτου, Ιδου τοσαυτα ετη δουλευω σοι και ουδεποτε εντολην σου παρηλθον, και εμοι ουδεποτε εδωκας εριφονινα μετα των φιλων μου ευφρανθω · οτε δε ο υιος σου ουτος ο καταφαγων σου τον βιον μετα πορνων ηλθεν, εθυσας αυτω τον σιτευτονΜοσχον. 29-30 However, he said to his father, "See, for so many years I served you as a slave, and never once did I transgress your commandment, and yet to me you never once gave a kid for me to enjoy myself with my friends. However, as soon as that son of you arrived, who ate up your means of living with harlots, you sacrificed the fattened calf for him”. The elder son remains unwilling and in his embitterment, he becomes stubborn and unreasonable. That he has always served his father faithfully and never transgressed his commandments, we can safely assume. But that he would never have given him any innocent relaxation with his friends, seems to be excessive and not very likely. In his anger, he is going to misrepresent matters. What keeps him occupied obviously is the more than bad behaviour of his brother. What a fool his Father is to receive someone like him festively, and what an injustice to him, the elder brother! As far as he is concerned, the so-called brother is completely dismissed for him. He does not want to know him anymore as such. Hence, his despicable that son of of you! ο δε ειπεν αυτω, Τεκνον, συ παντοτε μετ εμου ει, και παντα τα εμα σα εστιν · ευφρανθηναι δε και χαρηναι εδει, οτι ο αδελφος σου ουτος νεκροςην και εζησεν, και απολωλως και ευρεθη. 31-32 But he said to him, “Child, you are always with me and all the things that are mine are yours. We then had to rejoice and be glad, because this your brother of yours was dead and came to life, and he was lost and was found”. The father remains warm and understanding. He also loves his eldest son and acknowledges their intimate community and years of cooperation in defending their common interests. But his brother also belongs to the family! Remember, he has come to repentance! He was dead for us, but now he lives again. He was lost but was found. The parable ends with that admonition. Whether the son gave his ear tot his father's urgent call is not mentioned. In any case, he had no response. Judging by Israel's current situation, the Older son is still outside. For nearly two thousand years, Israel has refused to enter and participate in the joyful celebration. As a nation, she still holds unremittingly of her own merit, and she boasts in her own alleged justice. and in her own alleged self-righteousness, obtained by anxiously maintaing Torah. That this kind of "righteousness" does not count with God, and that, for Him, the only form of righteousness that is of real value results from faith - the belief that Yeshua is their true Messiah, and that salvation depends on the sacrifice of his own soul – is still rejected by the nation with haughty contempt (Isaiah 53:7, 12). Stubbornly she resists the rescue and forgiving love that the Father, in Yeshua, presents to repentant sinners. However, with such a mental attitude a child alienates from his father. Especially if there is only service. In that case you are no longer a child but a servant: Look! For so many years I am serving you [as a slave]. That is still Israel’s picture! Hard working and apparently serving the Father, but without real childish happiness in that Father. Instead, she shows disapproval, yes, of criticism: To me you never once gave a kid for me to enjoy myself with my friends. With that haughty attitude of self-esteem and intolerance towards the Younger brother, Yeshua’s congregational Body, Israel has imitated the example of the Pharisees with whom Yeshua was constantly in conflict. With much heartache the apostle Paul - in the chapters 9, 10 and 11 of his Letter to the Romans – has recorded the awful results of that stubborn attitude for the nation. In Romans 11 we learn that YHWH Elohim, the Father - in the First century - his stubborn Eldest Son has shut up in disobedience; confined as it were to a spiritual prison like situation. Until the fullness of the Gentiles should enter. For then, a mere Remnant of the nation will eventually come to repentance and recovery. Everything points to the fact that this happy reversal is approaching swiftly (Rom 11: 25-33).